Modern Retail has made it easy for you to configure these values in Store Manager using our Marketplace Selector. In Store Manager, go to Marketing > Marketplace Selector (under Marketplaces) and select Google Products from the drop down menu. Make sure the view is set to Departments as shown below. You will see 4 columns for Gender, Age Group, Google Product Type and Apparel / Handmade. Please fill out each item next to every department in your catalog. For the Google Product Type, you will need to click on None which will display a popup of all the available Google Product Types. This list comes directly from Google and is pretty extensive. Do the best you can to assign the appropriate Google Product Type for every Department. If you can't find an exact match, then you'll need to find one that's as close as possible. You only need to do this once and it does not need to be defined for Categories, just Departments. 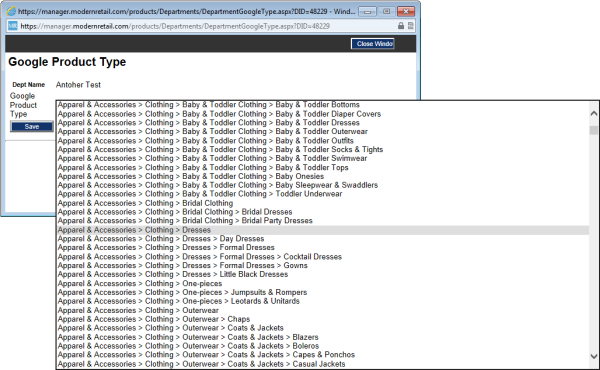 You must define this Google Product Type for every Department in your catalog. Without it, Google will not add your products to the Google Merchant Center and you will not be able to create a Product Listing Ad.